Submitted by tapsearcher on Thu, 07/14/2011 - 20:58. This artwork, part of Ray Tapajna's Art that Talks series, is a marker for history and future generations to know how the American Dream was Reversed by President Clinton who passed the free trade programs designed by the elder President Bush. His son, President Bush, the second, hid the economic mess behind his shock and awe pre-emptive wars. President Obama followed and bailed out those who were responsible for the free trade economic failure. President Obama bailed out big money, the investment communities, the banks, Wall Street and the "too big to fail" corporations while ignoring the suffering of all who lost everything due to free trade. Note: Google has millions of resources and results related to the above. Clinton Years American Dream Reversed - the Eye of global economic storms. 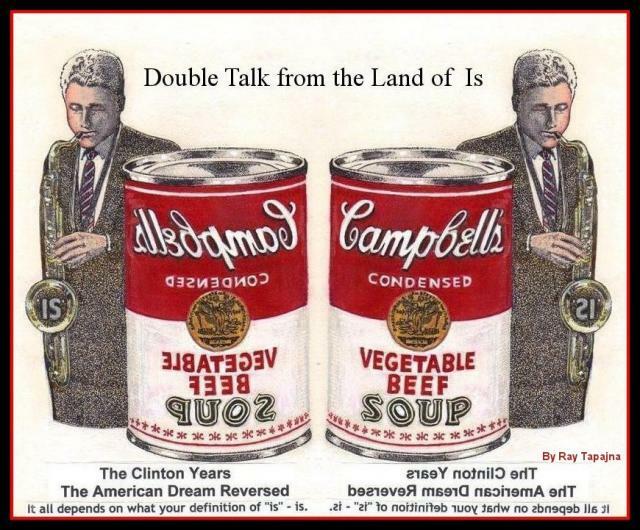 Clinton Years - American Dream Reversed || Graphics Forums ..
Ray's Clinton art is symbolic of a time when prosperity was proclaimed by President Clinton during the most massive dislocation of jobs in U.S. history including the Great Depression. The Y2k crisis hid the story with billions poured into the economy to fix the nations computer systems before the year 2000 came. Alan Greenspan in his book - The Age of Turbulence -, told about the billions spent to fix the problems. It was acted as a stimulus package but the money spent was money that few could afford to spend. And many companies after 2000, could not overcome the artificial situation also covered the stock market advancements triggered by all the high tech start ups that were not real too. Then when 2000 came around the spending was over and exposed how weak the start ups were. Many failed at a very fast rate and the stock market took a big fall. We kept records of all the jobs and company close downs in 1998. It shows a collapse of many different businesses and corporations with the loss of millions of jobs across the board. This all happened while President Clinton was being impeached for other activities. He said everything depended on what your definition of what the word "is" , is. This is what it came down to during his time in office in the land of "is" as he consummated free trade. This proved to be the core of our economic crisis where the value of workers and labor was degraded. The value of workers and labor is a real tangible value that is more of a money standard than paper money itself. Someday, the loss of this value due to free trade will be defined and it will show how much Americans lost in the process. Some experts tell us that the trade deficit alone represents a terrible lost. The money lost could have been used to provide $50,000 for every family in the U.S. to buy a home. The American Dream was reversed. 2012 - The new rendition of the Clinton Years American Dream Reversed artwork titled Double Talk is symbolic of nothing changing in the surge of free trade and globalization with President Obama and President Bush bailing out big money, banks, Wall Street and large corporations while ignoring the suffering of workers who lost their jobs with many losing everything else. When NAFTA and GATT were passed in 1994, all who lost their jobs or businesses due to free trade were promised help. They received nothing. It is also is relates to the longest war in U.S. history in the Middle East. The chaos continues and invites new wars for years to come. As a change of pace during these troubled times, Ray Tapajna has created new Living Healing Art and Flowers for You That Last Forever Where Everyday is Valentine Day. Take a break and stay awhile and let his new living healing art refresh your spirit and your day at http://ray-tapajna.artistwebsites.com You can view the healings waters in motion flowing your way at http://tapsearch.com/about-ray-tapajna At http://tapsearch.com/about-ray-tapajna/id17.htm , you can click on the image and have the Healing in Blue Waters coming your way on a page by itself. You can show it to loved ones in hospitals, nursing homes, treatment centers, waiting rooms etc and let the healing waters come their way too. Submitted by tapsearcher on Mon, 04/07/2014 - 22:11. Free trade remains the major cause behind our economic crisis. The value of labor and workers has been degraded and deflated. This loss represents trillions of dollars in value lost forever. The same applies to the trade deficit which has broken records since 1994. The value of labor and workers is a real asset and perhaps is a better money standard than all the funny money created out of nothing by the Federal Reserve Bank. Ray's main webpages are Ray Tapajna Journal, Keeping History Straight at http://tapearch.com/tapartnews http://tapsearch.com/communications-by-rank , http://tapsearch.com/flatworld , From therationale.com ( Philosopy and religion latent response to the global economic arena ) at http://ray-tapajna-info.net/therationale-journal http://ray-tapajna-info.net/workers-dignity-betrayed and from bizarrepolitics.com ( Untold stories behind the news ) now also at http://http://ray-tapajna-info.net/bizarre-politics-news and http://tapsearch.com/bizarrepolitics-top-blogs Our economies based on making money on money instead of making things and adding value in a multi-level fashion are burning out with investments divorced from production. As a completely free courtesy, enjoy unlimited services, tools and items to promote your business, webpages. advocacy or any endeavor at http://tapsearch.com More at http://tapsearch.com/super-links and Free books at http://tapsearch.com/amazon-friends All completely FREE. Submitted by lmcshane on Tue, 04/08/2014 - 06:10. I don't mind your adverising here. It indicates wide readership. Jeff B. is not so open-minded and will consider it spam. Your original post was not loaded w/ads and had more content. Just a heads up - I know Guy is a fan of yours.